On Sept. 7, 2017, an 8.1-magnitude earthquake struck the coast of Chiapas in southern Mexico. The Mexican government declared an emergency in 41 cities in Oaxaca state and 118 in Chiapas state near the epicenter. In worst-hit Oaxaca, 12,000 homes had been damaged and more than 800,000 people became homeless. The people’s anxiety reached a peak as over 1,000 times of intense tremors continued until the morning of Sept. 11. 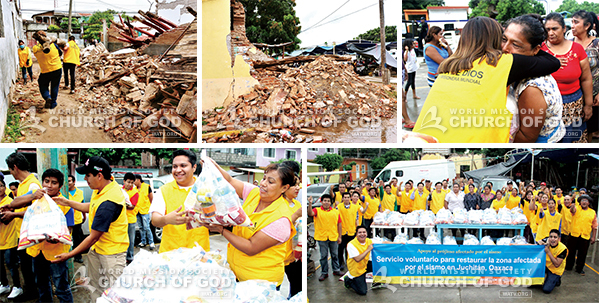 The members from the Church of God in Mexico City and Puebla learned the terrible situation of the stricken areas through the media and decided to practice Mother’s love; 43 male members volunteered for the restoration work, taking days off. On Sept. 13, the members left to Juchitán in Oaxaca, a 10-hour drive away from Mexico City, carrying 1.5 tons of relief goods like rice, salt, and water. Hearing the news of the church members’ taking time off for the relief efforts, their colleagues and friends donated relief supplies. 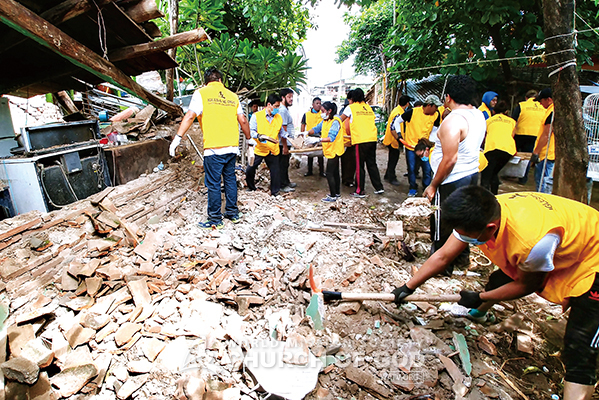 Guided by the city officials, the church volunteers moved to the area where the helping hand was needed most. The small square full of remains of ruined buildings showed how horrible the quake was that day. On the 14th, the members first delivered daily necessities along with the words of consolation to 150 households who suffered the earthquake. The residents thanked the volunteers for coming a distance, gave them a hug, and shed tears in their arms. The church volunteers began the restoration work, wearing protective gloves and masks. They helped move the building debris to the main street with shovels to ease the work of the heavy equipment. Gloria Sánchez López, Mayor of Juchitán, expressed her appreciation to the members for helping Juchitán City suffering from a significant damage and praised them for their efforts to “put into practice the teachings of God’s love.” “The volunteer service of the Church of God is a great comfort to those who have lost their precious families and their livelihood,” said Pamela Pineda, an official of the electric power in Juchitán. Julissa Carrasco Sanchez, an official of the Health Department, was particularly amazed at the fact that young people volunteered for the restoration activities, regarding others’ pain as their own. On the 19th, another 7.1-magnitude earthquake followed in Mexico, which had already suffered serious structural damage around Mexico City, and the government offices and schools under the influence of the quake were temporarily closed. In the situation where aftershock lasted, the local church members prayed for the safety of the Mexicans, giving personal support to their relatives and neighbors in need.